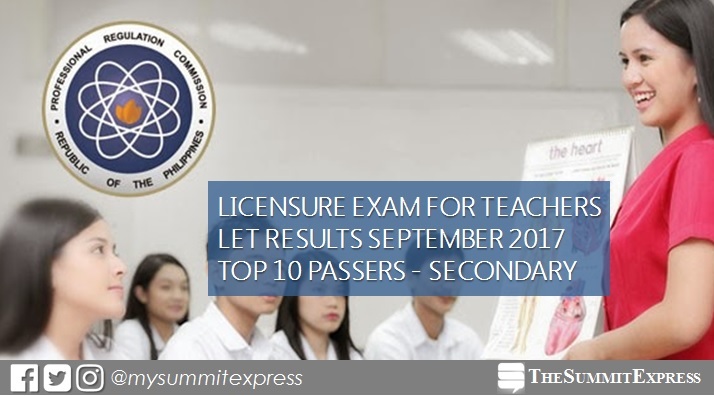 MANILA, Philippines - The full list of topnotchers or the top 10 passers for September 2017 (Licensure Exam for Teachers) also known as Teachers board examination for Secondary Level is officially released by the Professional Regulation Commission (PRC) and the Board for Professional Teachers (BPT) on Monday, November 27 or in 43 working days after the exam. Rhoy Autentico Omega from University of Mindanao (UM) - Davao City aced the Secondary level exam with 93.80%. Brian Monpon Ba-an also from UM-Davao ranked second with 92.60%. Those awaiting the results for Secondary Level can check here soon the name of successful examinees who got the highest grades for September 2017 LET board exam. The list includes the rank, school and average rating. More than 180,000 graduates of Education course took the licensure exam in 27 different testing centers nationwide: Baguio, Bacolod, Cagayan de Oro (CDO), Catarman (Northern Samar), Cebu, Davao, General Santos, Iloilo, Laoag, Legaspi, Lucena, Manila, Rosales (Pangasinan), Tacloban, Tuguegarao, Pagadian, Zamboanga, Mamburao, Occidental Mindoro; Calapan City, Oriental Mindoro; Odiongan, Romblon; Kidapawan Cotabato, Boac, Marinduque; Virac, Catanduanes; Puerto Princesa City, Palawaan and Masbate City and Hong Kong and Bangkok (Special Professional Licensure Examination or SPLE). In September 2015 LET, there were 27 topnotchers who occupied the Top 10 list for Secondary level. Eula Mae Carlos Busbus from University of Mindanao (UM) - Davao City topped the board with 90.20-percent rating. In the September 2016 exams, Richard Cabuay Macapulay from Tarlac State University (TSU) aced the secondary level exam with 90.00%. PRC Resolution No. 2016-1019 stated that the target release date of September 2017 LET results is on Monday, November 27 or in 43 working days after the exam. Note that government work was called off on October 16 and 17 due to nationwide transport strike and on November 13 to 15 due to ASEAN Summit and Related Meetings in NCR and Pampanga.